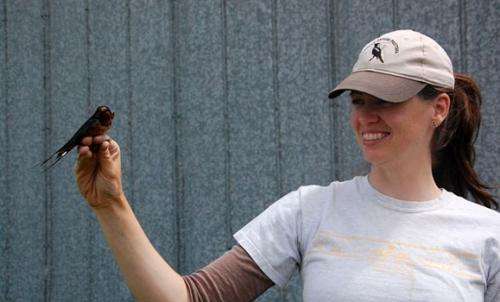 PhD student Tara Imlay holds a male Barn Swallow. Extinction: the permanent loss of a species. It is deeply troubling—and scientists and birdwatchers are ringing the alarm about a bird species that only a few decades ago was widespread and very common. Swallows, along with other birds that feed primarily on flying insects, are experiencing the greatest population declines for any group of birds in North America, and their declines are particularly pronounced in the Maritimes. The Barn Swallow, for example, has seen a 95 per cent drop in numbers across North America in the last forty years, placing it on the endangered species list in Nova Scotia. PhD student Tara Imlay and master's student Sarah Saldanha are trying to figure out why this is happening—hopefully, a first step in reversing this alarming trend. "This decline is especially concerning because this type of bird used to be so widespread and abundant and the decline of a common, widepread species hints at a broad scale cause," explains Saldnha. "Although this decline may be attributed to changes in North America ecosystems, it may also be attributed to changes in the birds' wintering grounds." Working for the summer from a busy research station near Sackville, N.B. (run by Acadia University and Ducks Unlimited), the two student researchers are focused on the decline in Bank, Barn, Cliff and Tree Swallow populations in the Maritimes. "I grew up in Wolfville and I have always been interested in the conservation of species in the region," says Imlay, "I heard about the huge decline in swallows and the lack of information about the cause so I really wanted to investigate this question. Understanding the cause—or causes—of declines is vital for determining the right steps to reversing these downward population trends." There are two leading theories about the decline. The first suggests it's driven by a related decline in insect abundance or a mismatch in the timing of when insect abundance is highest and swallows are breeding. The second theory is connected to the fact that the greatest declines have been in birds that migrate long distances to Central and South America. This theory suggests that conditions at wintering locations or during migration could be impacting these species. Imlay and Saldanha are examining the first of these theories: the relationship between daily insect abundance and the timing of swallow breeding. They are closely tracking a multitude of factors in the swallows' summer routines, including variable insect populations, the date the first eggs are laid, the date eggs hatch, the number of eggs laid and the number that hatches, and chick survival rates. This data will allow them to determine if insect abundance is limiting population growth. They're also looking at the foraging habits of Bank Swallows during the breeding season, using very small radio transmitters on the birds and high-tech receiving towers to monitor the birds' movements. "This is the first time automated telemetry on is being used on the local scale," says Saldanha. "With this technology, I am getting a much better understanding of how the birds are travelling and using the habitat in their daily lives." The number of daily foraging trips and their distance from the breeding colony may suggest clues as to insect abundance. To test the wintering ground theory, they are using a variety of methods, including lightweight nets to collect feather samples from adult birds to determine where the birds spend the winter and their stress levels during the wintering period. This data will allow them to determine whether wintering ground conditions are also impacting populations. The robins and hummingbirds can through central Florida heading north, from their wintering grounds in central/south america and Caribbean, right on schedule. Plenty of monarch butterflies as well, returned to their place of hatching (my backyard). What, now you're keeping track of birds and insects you freaking commie?